People choose sliding doors for various reasons. For starters, they are pretty and give a modern and elevated look to your home. A sliding door design is convenient as it provides tons of space. The best sliding glass doors can transform a dark and crowded room into a bright, spacious, stylish space with minimal investment. Let’s be honest sliding glass doors are the perfect reason to class up your home at a reasonable price. Including sliding doors in your home can be a smart move because of their many design and functional advantages. What more advantages one can get if you have a sliding door design? Sliding doors designs can be capable insulators as they will keep your home warm in winter and cool in summer. They offer thermal insulation effectively acting as a weather and sound barrier and also keeping dust, draft, and rain out of the home. Sliding doors designs have a very homely and secure feel. Homeowners are nowadays getting sliding doors which have shatterproof safety glass. Also, sliding doors are designed with stiles for extra stability, which creates bridges between indoor and outdoor. Homeowners can easily move the sliding door design as they are on their rails. You just need to gently push them aside and they will glide open. This comes in handy, especially during hot summers. Sliding glass doors manufacturer like Aparna Venster’s uPVC doors are eco-friendly as they are made up of lead-free substances adhering to strictest European norms. As sliding glass doors are designed to simply glide along a track instead of swinging open, it saves extra space as no space is required for the door arc. They simply open up by one door sliding over another panel. Sliding door designs are classy, elegant and class up a home in the most sophisticated manner. The functionality and practical design maximize natural light and outdoor views. Aparna Venster’s sliding glass door consists of 2 track 2 panels or more with or without mesh. A slider door design can also be offered in a combination of fixed and slider window joined with a couple. 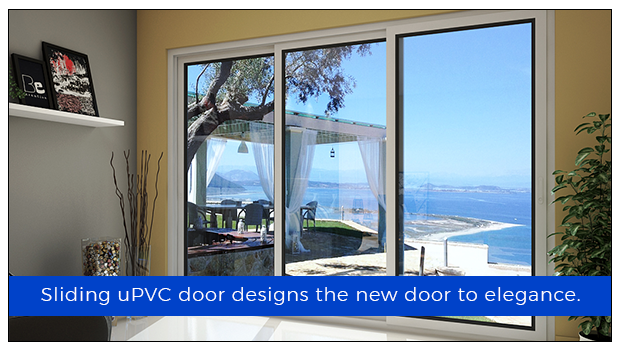 With multipoint locking system, Aparna’s sliding glass doors can give your home aesthetic value and also security. So explore now.